Just click on below to be taken to their site. You will really want to to watch this video to see how fast and easy it is to completely transform practically anything into layered, textured, beachy goodness. I’ve totally gone coastal. This was a great product to work with so easy to mix up. I used two similar blue paints I had left over from other projects. Let dry taped off without sanding yet and did the top coat with a dry brush white paint. Took off my tape soon as I finished the wait I’ve heard if you remove tape while paint still moist you get crisper lines. I then let it dry off and gave it a quick lite sanding and am totally loving this look. A big thanks to Saltwash for providing the Saltwash I needed for this project. Someone will win this contest and they will receive a prize package from Saltwash and Saltwater Salvage Design. his is a sponsored post. Saltwash provide each of us a ‘bucket” of Saltwash to use on our piece. But all opinions are 100% my own. 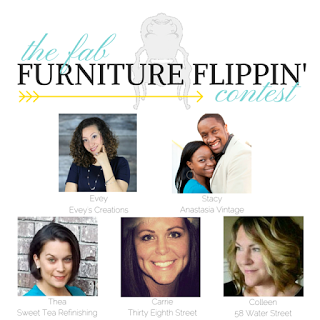 Thanks to the awesome women that coordinate this whole Fab Furniture Flippin’ contest. I’m loving this experience. Here’s a close up of the saltwash sweetness. Love the transformation Anj! The pops of color are beautiful. Great job! I love salt wash and can’t wait to use it again. Love the stripes, looks like it came out out of one of those old fashioned suit changing canvas cabanas from a old era beach resort! Nice job Arod! Oh my goodness, that turned out so dang cute! I really love that color too-it’s something I’d be happy to have in my home or yard. Love the way it looks! I will have to try salt wash – looks wonderful. So crafty and creative. We love the blue color you picked. I just ordered Saltwash and can’t wait to give it a try. The bench turned out amazing! Love the stripes!